Eleven years after the passengers of flight BA142 from London to Delhi developed extraordinary abilities corresponding to their innermost desires, the world is overrun with supers. 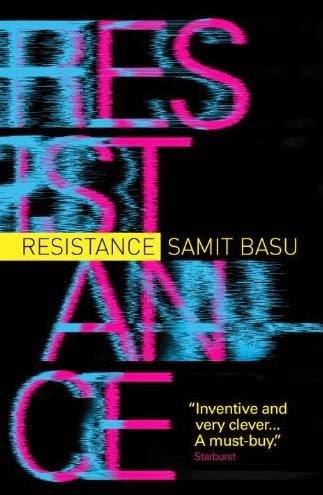 After having read the original novel Turbulence by Samit Basu, I was impressed with the skill and wit in the writing but was left feeling like I wanted to know a little more about the characters and the actions surrounding the the gaining of the powers and their reactions to them. It just felt like a little bit was missing. Here in it's sequel Resistance, that problem is long gone. Instead that's been replaced with a tighter pace, well rounded characters and some really well placed revelations about not only the characters but also their powers. I loved the idea that not all people wanted to play the hero once they had gotten their powers. While that idea wasn't taken to the extreme that it was in the comic series named Death Sentence, Basu takes a little more subtle yet well written approach. Yes some of the people who gain powers go the stereotypical 'let's save the world' route and others just want to watch the world burn. I loved that about the story. Another thing that blew me away was the simple fact that there was so much happening in the story and so many threads that were running alongside one another that I was a little worried that it might get a little jumbled or confusing. That's not the case here at all. When all the pieces start to come together, it's just like watching a master painter working on his next piece of art. That's massively helped by the pacing here too. The story moves along at quite a quick pace but Basu doesn't leave any of the characters behind or loose ends. That's the sign of a good writer and Basu is definitely one of those. Characters wise, we get a whole load of new characters and they all fit in to the world that he was created very well. We also get the return of some of the faces from Turbulence as well, with a couple of my favorites making triumphant returns. If you are in to superhero stories but with a bit of a more human edge, then this is definitely the book for you. It's well written, has great pacing and memorable characters so what are you waiting for?